Go to www.nomenu.com for the entire list of restaurants in the New Orleans area. They are listed by neighborhood, type of food, and days open. It includes reviews , recipes, links and information which are invaluable to anyone visiting our city. Do NOT eat at a chain restaurant while here and toss your diet temporally aside. Part of the fun of New Orleans is enjoying every delicious morsel you eat. The above website is written by Tom Fitzmorris, our native food critic, who has been hosting a talk radio food show everyday for the last 30 years! 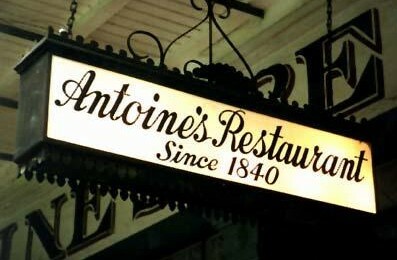 For 177 years, this original family owned Antoine's is one of New Orleans' Grand Dame restaurants in the French Quarter. 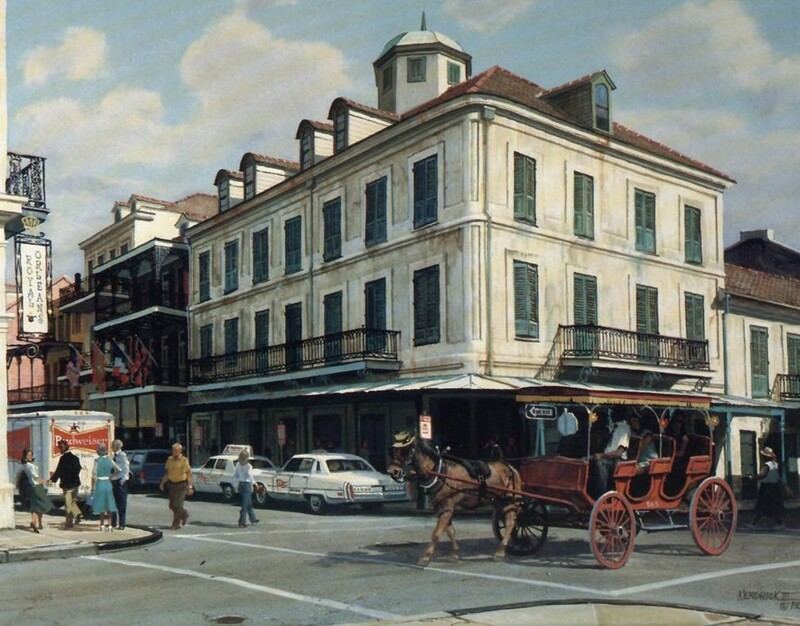 While one of our finest French Creole dining establishments, they offer a surprising $20.17 three course lunch and $0.25 daily cocktail! This best deal in town is available for parties of 15 or less, Monday - Saturday, 11:30am-2:00pm. Locals know about it; you may have to ask. If you have time, ask for a tour of the restaurant and look closely at the memorabilia on the walls. A must for every New Orleans visitor! 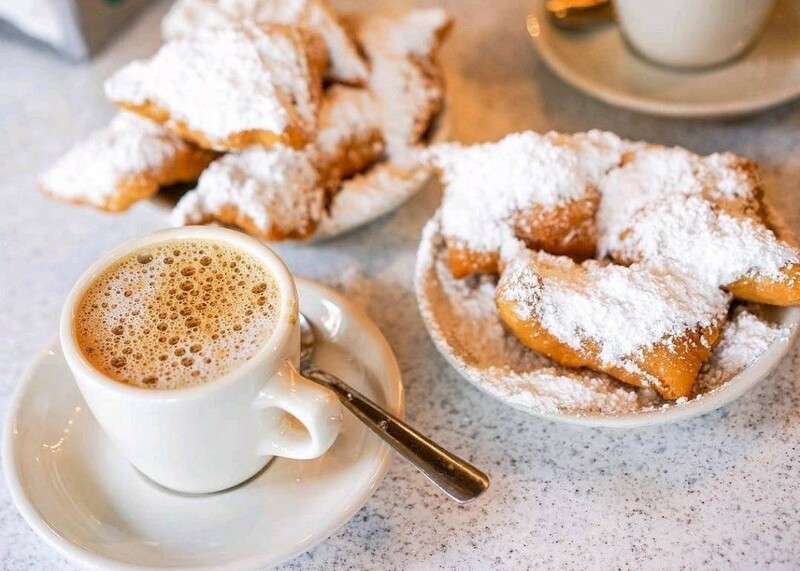 Since 1862, Café Du Monde have served a wonderful cup of Café au Lait and delicious hot beignets (New Orleans donuts) for less then $5. Locals love it. It's a wonderful way to start a day of touring or for late night treat. Skip the line if it is too long and go inside to quickly order to go. Then find a spot to sit in the French Quarter and people watch. Oh, what you'll see! Splurge with Breakfast at Brennan's in the French Quarter. It is a sophisticated, elegant way to begin your day in New Orleans. Start with a brandy milk punch and finish with the bananas foster, where it was invented! 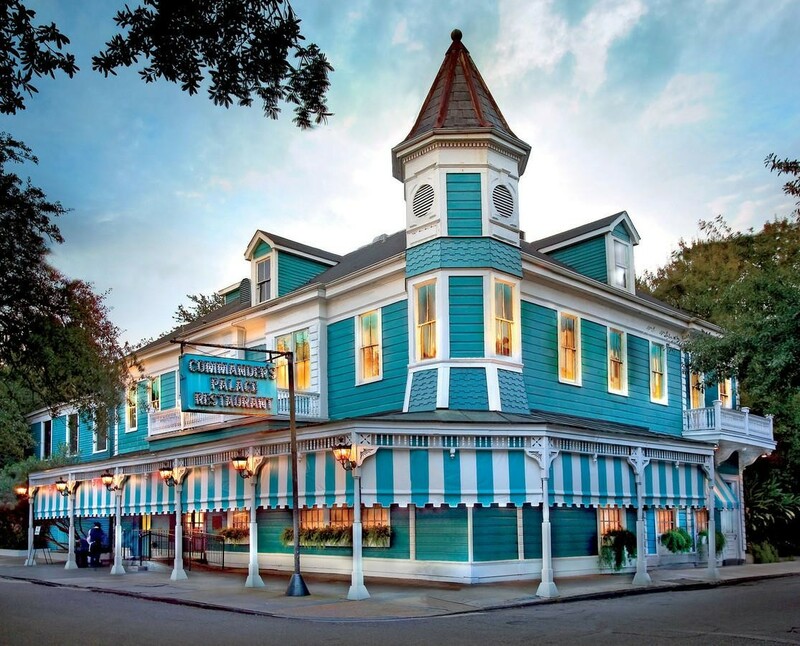 Commander's Palace is probably what New Orleanians would say is our finest restaurant. Nestled in the lovely Garden District, enjoy the ride while viewing the beautiful mansions from New Orleans' glory days. You can even take the scenic streetcar. This landmark restaurant for Haute Creole cuisine has a history of hiring chefs who go on to become renowned such as Emeril Lagasse and Paul Prudomme. It truly is an incredible dining experience. Jackets are preferred for men, but not required. No one is allowed in shorts or t-shirts. Want to indulge without breaking the bank? Go at lunch and order from the luncheon specials (Monday- Friday 11:30am-1:30pm) - under $20 for a two course meal and $0.25 martinis! While the Central Grocery Store is famous for the original Muffuletta, Mark prefers the one made here. This casual restaurant is housed in history. It was part of a plot to provide refuge to the exiled Napoleon Bonaparte that never came to pass! (That is why there is a copula on the roof from which you can see full view of the river.) Recently acquired by the Brennans family of restaurants, this inexpensive French Quarter restaurant provides classis creole favorites with a wonderful old world New Orleans ambiance. Be sure to cool off with a Pimm's Cup. 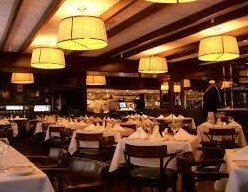 Another Brennan's family restaurant, Mr B's is considered the original New Orleans gourmet bistro. Located across the street from the Hotel Monteleone, they are famous for their Gumbo Ya-Ya, Shrimp & Grits, and Barbecued Shrimp (Nope, our Texas friends, nothing like your BBQ- but trust me, it is just incredibly delicious!). Jacques-Imo's is the quintessential casual, funky-chic New Orleans restaurant in the Riverbend district. (You can take the streetcar.) The Cajun food is fabulous and the atmosphere is eclectic. There is even a special table sitting in a truck bed parked on the street! 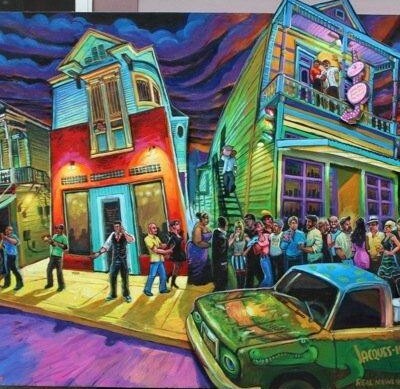 I think Jacques-Imo's reflects the true New Orleans which is a mix of many different types of people that blend together to form this unique city. I warn you, it is hyper-popular with locals and I advise you to go very early (Monday-Saturday 5pm-10pm). The lines are always long, but everyone pops into the Maple Leaf Bar next door to buy a drink to cool off while socializing on the sidewalk. You will say, however, it was worth the wait! If Jacques (the chef and owner) is wondering amongst the customers, show him the love- who knows, he just may treat you to a drink or desert. 504-861-0886 -Reservations only by phone for parties of 5 or more. Katie's is a favorite New Orleans style, casual neighborhood restaurant serving gourmet poboys, seafood, & Italian. It is reasonably priced and delicious. 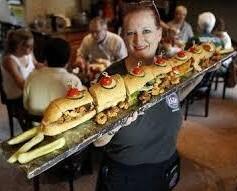 Share "the Barge" with the table, an entire French bread overstuffed with fried seafood, or overstuff yourself with the Ledgend, a cochon de lait poboy with BBQ shrimp! Located in Mid-City, you can take the streetcar. Too many favorites to name!